As every carver knows, it's essential to hold your work securely or you could have a nasty accident. 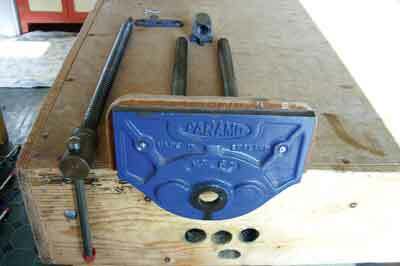 There are many ways to hold your work and here, I'll show you the ones I use most frequently in my workshop. 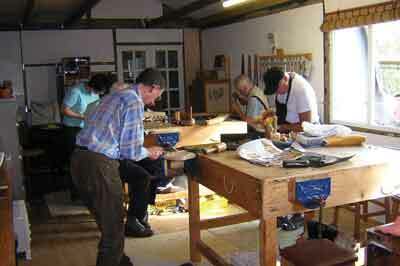 Our main carving work is usually carried out on one of the two demountable square bench/tables. Each face has a woodworking vice fitted, which opens to 305mm wide and is ideal for the heavier mallet and gouge roughing out of a carving in the round. The design may be of interest to group leaders - we devised these benches when I was teaching woodcarving in a village hall with no working facilities and the class of eight carvers had to be accommodated - and a bench can be constructed in less than five minutes by two people, which is very handy. The top of the bench/table is a box construction of 100-100mm plywood, the size chosen so it can be slid easily into the back of our van and the main body of each vice is bolted permanently in place underneath the tabletop. 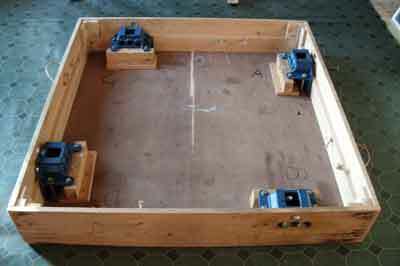 Using the rope handles on each side, the box top can be rotated on its edges and moved into the room ready to insert the legs into the corners. 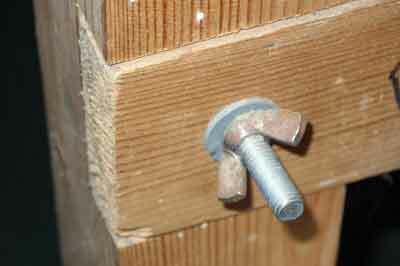 The two 75 x 75mm timber 'H' shaped legs slot into the corners and are fixed across the angle with 125mm bolts, washers and wing nuts, which can be easily and quickly removed by hand. 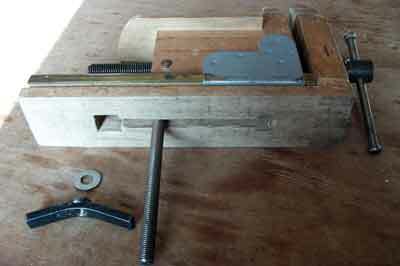 Two 75 x 50mm braces are similarly bolted in place between the 'H' legs for stability, then, using the rope handles, the table is uprighted ready to fit the four vices. 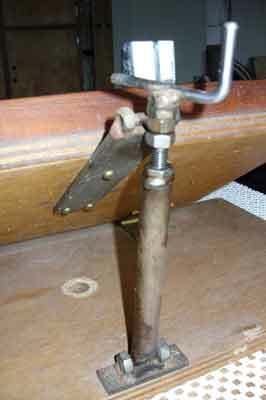 The basic woodworking vices open to 305mm and are simple and quick to install by sliding their two tubular guides into the body of the vice bolted under the tabletop. 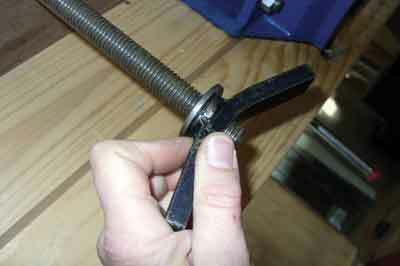 The long centre screw is then engaged into the floating thread within the vice body and its end plate secured with a spring washer and an 'R' clip instead of the split pin normally used, which can be more easily removed by pulling it downwards when the vices are uninstalled at the end of the class. 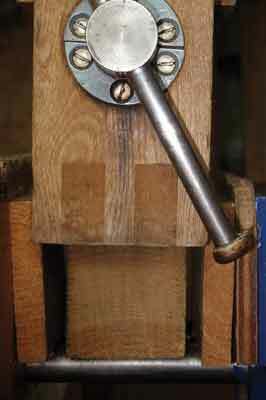 A wooden faceplate covering the metal is fitted to each vice, its grain running vertically, its mounting screws countersunk so that the carving does not get damaged from the pressure of the vice when tightened. 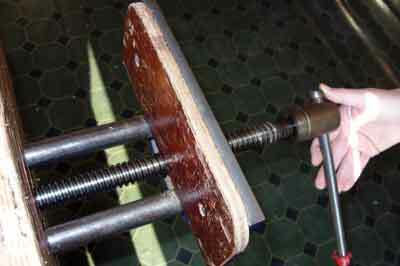 The tightening bar can give a nasty nip to your hand if it slides down. To prevent this, tape is wrapped around each end of the bars, or you could use thick rubber bands instead. Using four wooden blocks, the height of the tables can be adjusted under each foot to the elbow height of the carver, which is the most comfortable height. 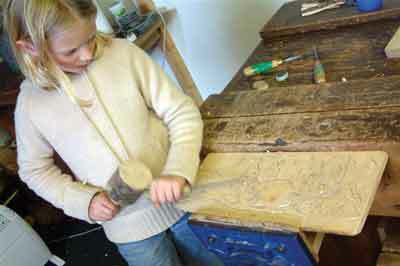 For children and small adults, we have a traditional school woodworking bench; this is fitted with two large vices opening to 305mm and 380mm for larger work and its height can be adjusted, if necessary, as before, using suitably sized blocks of wood. For the lighter and more delicate work, or awkwardly shaped carvings, we use traditional carver's chops because they are versatile, and being wooden, your tool edge will not be damaged should you accidentally slip with it, unlike a metal holding device. 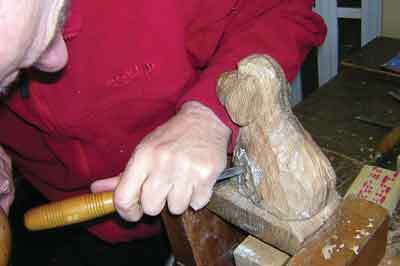 The chops are fastened through a hole in the tabletop by using a square-headed, heavy-duty bench screw, which is inserted into the rebate of the chops and tightened from underneath by means of a large wing nut and washer; this enables the carver to turn the chops as desired without removing the carving from its jaws and thus accessing it from all round. 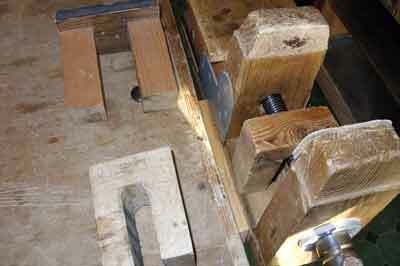 If the carving needs to be lower, then the chops are fixed in a vice, resting them on a block of wood - so they cannot inadvertently descend - and fitting them between two wooden 'cheeks' each side of the size so that the brass rails can move and the width of the jaws can still be adjusted while they are fastened in the vice. 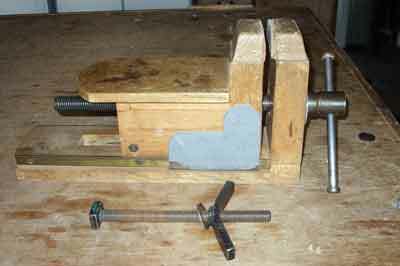 The main advantages of the chops are that they are portable, they can be fixed into a Workmate-type bench, you can quickly and easily take out your carving to examine it, you can hold a carving which is impossible to fix securely in a vice, and, most importantly, by carving with your elbow resting on its table, you have complete tool control for tiny carvings such as my peapod, which is 30mm long and less than 10mm wide; a boxwood (Buxus sempervirens) trug, 20mm wide, and a yew (Taxus baccata) wooden hen on a milk churn, which is 30mm diameter. 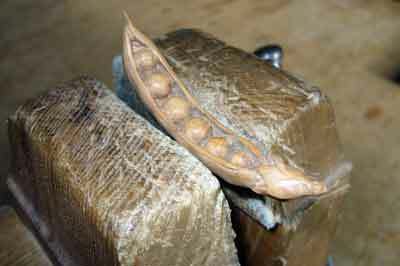 Carver's chops open to about 110mm wide and can be used to hold a relief carving by supporting it beneath with a wooden 'bridge' of the appropriate height. We also use non-slip router mats laid on the top of the table, or with the carving and mat placed in the well of the school bench and working against the edge of the tool well, and also by working against a bench hook secured in the vice. The advantage of using a router mat is that you can simply lift the carving to turn it round when you need to cut in the opposite direction, which is very useful and timesaving when carving something like a large signboard. 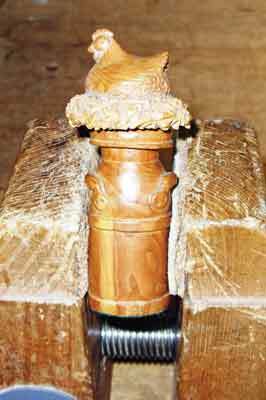 A relief carving can also be held in a conventional woodwork vice, but it should be supported from beneath, preferably with the grain of the wood running towards the vice faces so that it doesn't split lengthwise when the vice is tightened. 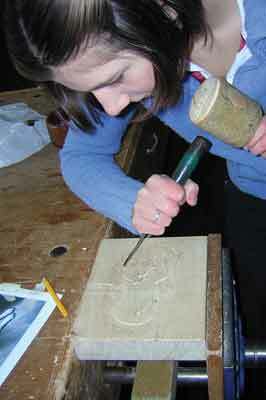 When it is necessary to hold a relief carving at an angle, or sit to carve rather than stand, we have an easel-type device, which is secured to the bench with a bolt and wing nut or placed on a router mat. 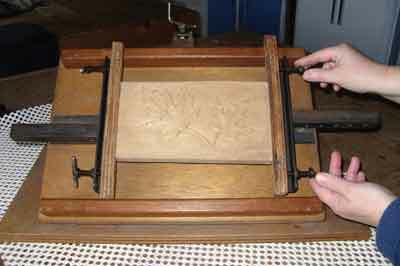 The panel to be carved is rested on two central sliding bars, which are pinned together and tightened in place with the four adjusting screws. 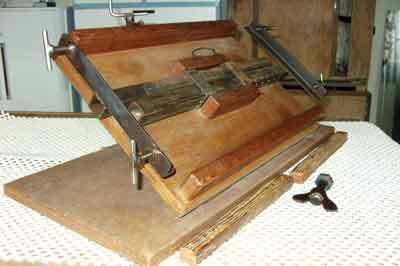 By turning the screw adjustment at the back of the easel, it can be raised or lowered to suit the carver. 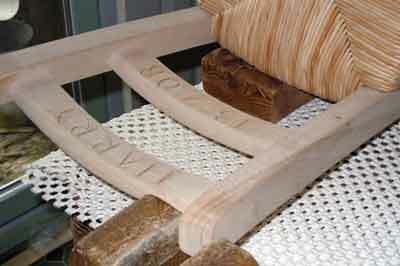 Sometimes you need to use a combination of holding methods, as when carving the inscription on the back splat of 'Harry's Chair'. Normally I would incise the letters the correct way up, but a combination of my anatomy and the chair seat made it impossible to reach the splat in the conventional way. 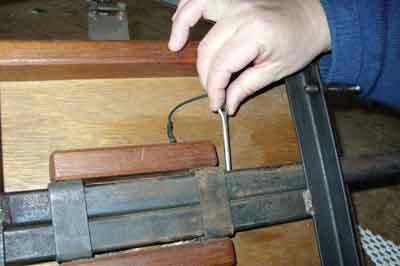 To be accessible, the chair had to be secured resting on the router mat to prevent it slipping and the chops, held in the vice, and used to grip the chair which then had a supporting block of wood placed underneath the back of the chair seat. At some woodworking/craft shows, two or three of us may be demonstrating woodcarving at the same time in a very small space. Depending on the type of carvings being carried out, we use our woodcarver's tripod, foldable Workmate-type benches, carver's chops and router mats as appropriate. 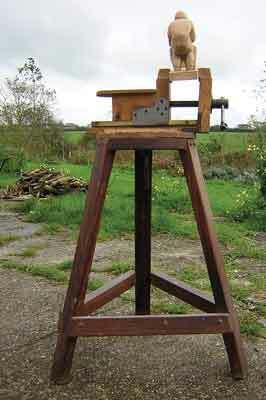 The woodcarver's tripod is very stable and has a revolving table into the centre of which the carver's chops are secured, thus giving all-round access to the carving in a confined area. 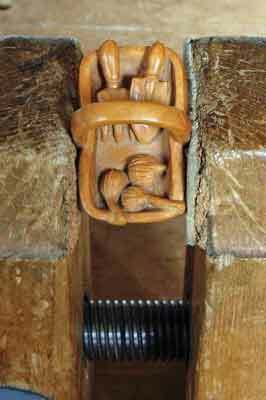 If you have only a confined space in which to carve, the woodcarver's tripod fitted with carver's chops may well be a good solution for you.